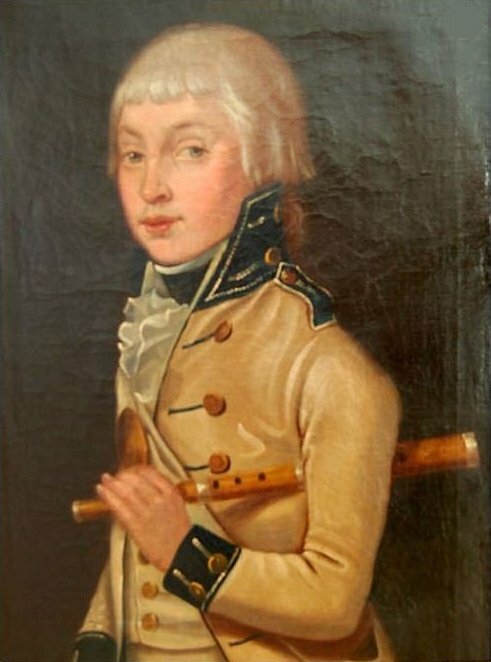 A pair of striking portraits of two young musicians, probably brothers, in reversed colour uniforms of the late 1790’s – buff single breasted jackets or coats faced blue, and buff waistcoats and breeches. I’m told that these were acquired in York, and brief inscriptions on the backs indicate “bandsman from York”. The younger musician holds a fife, while the elder is shown with cymbals and some kind of bearskin cap, apparently with a white feather. But the York attribution does present a problem: no York volunteers wore uniforms faced in buff. The only Yorkshiremen with buff facings known to me are the East Yorkshire Militia (“Beverley Buffs”), or the Halifax Volunteers of 1794, both in red, while another source suggests that Halifax musicians wore buff faced red, not blue. A foreign unit such as The York Rangers? It’s a mystery. My header image is a crop of a wonderful canvas by portraitist and marine painter Richard Livesay, on show in Portsmouth City Museum, but also online here at the BBC’s Your Paintings site. 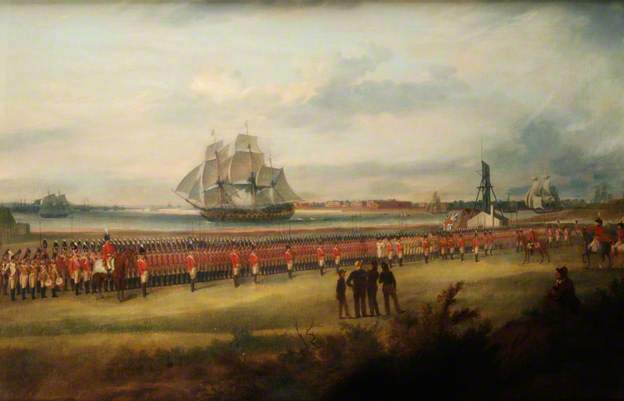 In 1796 Livesay had been appointed drawing master to the Royal Naval Academy at Portsmouth, so was on the spot to memorialise the newly re-embodied Worcestershire Militia reviewed by Major-General John Whitelocke and the Duke of York on Southsea Common on August 14 1803. I’m hard put to think of a comparable image of a full regiment of the period drawn up in line, certainly where militia rather than volunteers are concerned. At left, the drums in yellow with red facings (the drum major perhaps in white), then the grenadier company in their bearskins, followed by the battalion companies. At the centre stands the band in white with yellow facings, then the colours, and at the far end of the perspective the light company, almost too small to be seen. Behind the static line warships bowl past, while just to the right of the regimental colours can be seen the framework tower of the Southsea Common semaphore station, built to the Murray six shutter design. This was hi-tech stuff; the Portsmouth line could relay messages to the Admiralty at London in a matter of a minute or so. Altogether, this is a powerful image of national defence, alert and resolute. A framed reproduction of the painting is on show at Worcester Museum, but it is hung so far back in the case that no detail can be seen. Oddly, the original at Portsmouth is captioned as the Worcestershire Regiment (as opposed to the Militia) in 1823, but the Worcester copy is correctly labelled, while C C P Lawson has the regiment and period right in his mention in Volume 5 of his History of the Uniforms of the British Army. 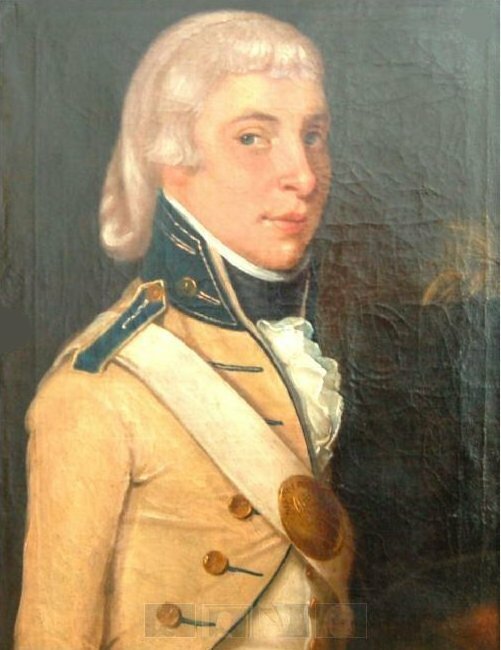 This was one of General Whitelocke’s better moments; in 1807 he commanded the disastrous expedition to Buenos Aires and was court martialled for his surrender. Richard Livesay was also responsible for five great aquatints of reviews of the Isle of Wight volunteers in 1798, all available at the Anne S K Brown Collection along with the print of his watercolour of the 1800 volunteer review at Hatfield. The Isle of Wight images bear detailed scrutiny and could be the subject of a later post.